Argo. Ben Affleck’s based-on-a-true-story “Movie of the Year” Oscar winner. I finally got around to watching it last night thanks to a free Redbox code, and you know what? It didn’t blow me away like I would expect the “movie of the year” to do. Don’t get me wrong; I enjoyed it as a paint-by-the-numbers thriller, but can anybody tell me exactly what made this the Academy-appointed movie of 2012? I probably shouldn’t get so hung up on the plethora of historical inaccuracies, but I have to admit I was a little disappointed when I found out that the majority of the best and most tense scenes were completely fabricated. Therein lies the trouble with watching a movie with your smart phone in hand. “Hmm, I wonder how much of this is true? What?? Welp, that scene was completely made up. Ooooh, this is tense! Sheesh, completely fictional as well.” Ah well, it was certainly worth a free code and 2 hours of my time. I think what really would’ve made this a legit Oscar winner is if during the “airport runway climax,” Jim Carrey appeared out of nowhere, hijacked a mobile stairway, and pursued the plane with the Iranians. If you know my wife then you know she loves her Dr. Pepper. Her body has adapted to it in such a way that I believe she now needs it for sustenance. Me? All I need to get through the day is the strength of the Lord and the smile of my wife. Kim? Sure, the strength of the Lord part is in there, but Dr. Pepper must be added to the mix. So as I embarked on my latest “run to the store and get Kim Dr. Pepper before her body goes into anaphylactic shock” mission; I was excited to see that each 12-pack of Dr. Pepper came with a free Redbox rental. Now we can throw down on some Redbox, and when the time came to cash in on the first coupon my feelings were a wild combination of excitement and nervousness. I was excited because the following movies were available: Wreck it Ralph, Skyfall, and Argo. Three movies both of us have been eager to see since they were released. Ah, therein lies the crux of this story of love and sacrifice. There really are no words to convey the awesomeness that is all over this. Check out the shirt that Hunter Mahan is wearing at the 1:20 mark and remember that the trend started here! “Welp, that does it. I do believe I have finally run out of things to say about this kind of movie. You know it’s bad when a movie so lacks any hint of originality that there’s not much original to say about it in condescension. Need a good laugh today? 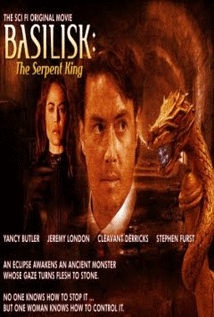 Read my review of Basilisk: The Serpent King. As all you fine readers know, my old site contained almost 500 movie reviews. A handful of them were actually pretty good. So I’ve decided to embark on the adventure of adding the old reviews to the new site. Not only will a good review repository bolster the site, but it will be a good way for me to post more frequently. Maybe you have, maybe you haven’t. But how many times have you re-watched a good movie or re-read a good book? Yeah, that’s what I thought. 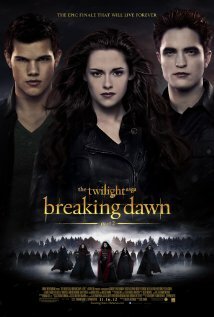 Re-read the reviews and reflect and reminisce. You’re welcome. 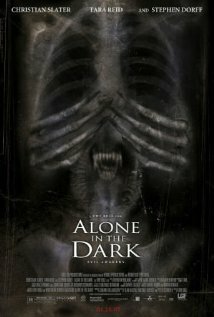 Today I have updated a classic – my hilarious review of Uwe Boll’s criminally bad Alone in the Dark. I just re-read it and laughed all over again. You will too. Quit your whining about my brief absence. Sheesh. Can’t a guy take some time off every once and a while? Well, I disagree. All superheroes take vacation, especially near the end of the year. Hey! I’ll take off as much time as I want and then you’ll thank me for my return! Thank you. Now enjoy this Gangster Squad featurette. If you’re nice and stop your complaining then I’ll post another one tomorrow. In an ingenious – albeit unconventional – casting decision, Jared from Subway plays Jared – a kid who has been a loser his entire life. His face is so pocked with acne that kids in school called him “Chocolate Chip Face.” Even his parents are embarrassed of him. Fed up with his unfavorable lot in life, he goes to visit a woman who is said to have mystical powers. After their meeting, she gives him a batch of “special” chocolate chip cookies that she instructs him to eat before going to bed. 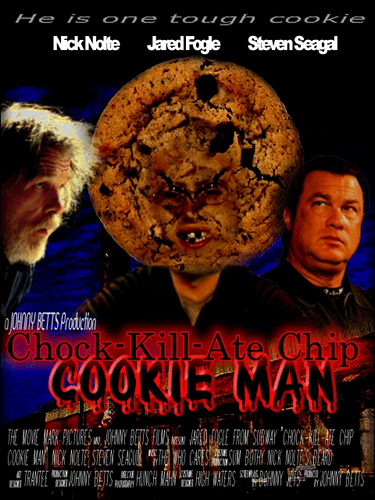 He does as requested and the next morning he wakes up and looks into the mirror to see that his entire head has literally been transformed into a chocolate chip cookie. Intrigued? You know you are. Now go read the full synopsis and have a great Thanksgiving. Who remembers Rebecca Black’s “song” Friday? Don’t worry; if you have never heard of it then I’ll acquaint you with it tomorrow. Everybody is intimately aware that November typically kick-starts a two-month long inundation of Christmas songs. But where are all the Thanksgiving songs? Well, you need lose sleep over that question no longer. Patrice Wilson – the Friday songwriter – has once again made an attempt to end the music industry as we know it with a new song called It’s Thanksgiving. This time it’s an unfortunate young lady by the name of Nicole Westbrook whose misguided desire for fame has put her in the cross-hairs of public ridicule. This Patrice guy just creeps me out. It’s not enough that he writes and produces this stuff, but he insists on appearing in and singing in the videos. This time he wears a turkey suit, a ridiculously out-of-place scarf, and perpetuates stereotypes. The man clearly has no shame. Sadly, he probably has plenty of money. I know this is brutal to watch, but hang on until 2 1/2 minutes in when Ms. Westbrook starts to rap at the dinner table. If this doesn’t make you want to sing “mashed potatoes on my table” into a turkey leg then I don’t know what will! Enjoy.